Powerful solar storms can charge up the soil in frigid, permanently shadowed regions near the lunar poles, and may possibly produce “sparks” that could vaporize and melt the soil, perhaps as much as meteoroid impacts, according to NASA-funded research. This alteration may become evident when analyzing future samples from these regions that could hold the key to understanding the history of the moon and solar system. As you watch the Moon over the course of a month, you’ll notice that different features are illuminated by the Sun at different times. However, there are some parts of the Moon that never see sunlight. These areas are called permanently shadowed regions, and they appear dark because unlike on the Earth, the axis of the Moon is nearly perpendicular to the direction of the sun’s light. The result is that the bottoms of certain craters are never pointed toward the Sun, with some remaining dark for over two billion years. However, thanks to new data from NASA’s Lunar Reconnaissance Orbiter, we can now see into these dark craters in incredible detail. The moon has almost no atmosphere, so its surface is exposed to the harsh space environment. Impacts from small meteoroids constantly churn or “garden” the top layer of the dust and rock, called regolith, on the moon. “About 10 percent of this gardened layer has been melted or vaporized by meteoroid impacts,” said Andrew Jordan of the University of New Hampshire, Durham. “We found that in the moon’s permanently shadowed regions, sparks from solar storms could melt or vaporize a similar percentage.” Jordan is lead author of a paper on this research published online in Icarus August 31, 2016. 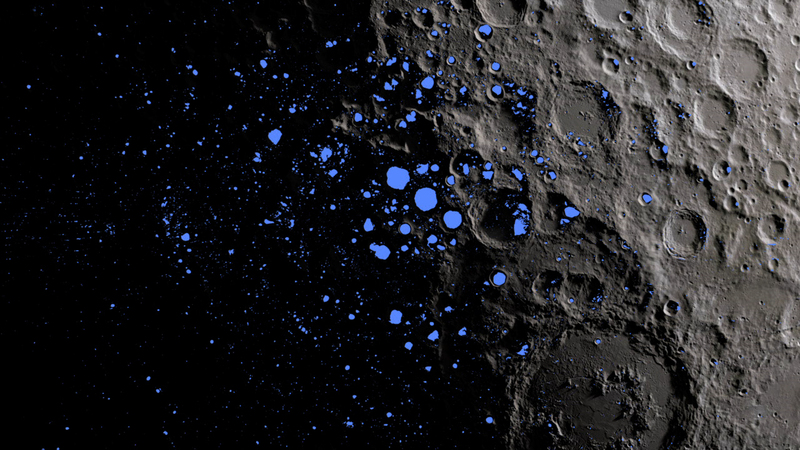 This is a map showing the permanently shadowed regions (blue) that cover about three percent of the moon’s south pole. Explosive solar activity, like flares and coronal mass ejections, blasts highly energetic, electrically charged particles into space. Earth’s atmosphere shields us from most of this radiation, but on the moon, these particles — ions and electrons — slam directly into the surface. They accumulate in two layers beneath the surface; the bulky ions can’t penetrate deeply because they are more likely to hit atoms in the regolith, so they form a layer closer to the surface while the tiny electrons slip through and form a deeper layer. The ions have a positive charge while the electrons carry a negative charge. Since opposite charges attract, normally these charges flow towards each other and balance out. 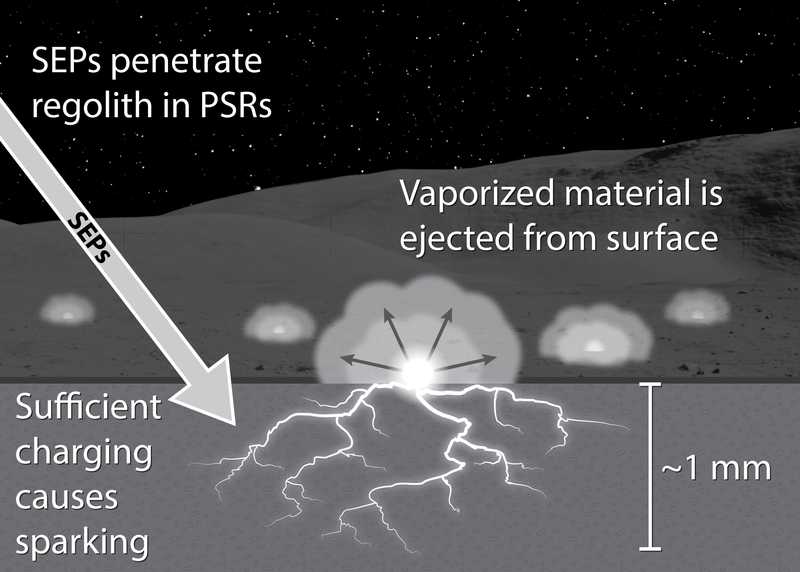 Illustration showing how solar energetic particles may cause dielectric breakdown in lunar regolith in a permanently shadowed region (PSR). Tiny breakdown events could occur throughout the floor of the PSR. In August 2014, however, Jordan’s team published simulation results predicting that strong solar storms would cause the regolith in the moon’s permanently shadowed regions (PSRs) to accumulate charge in these two layers until explosively released, like a miniature lightning strike. The PSRs are so frigid that regolith becomes an extremely poor conductor of electricity. Therefore, during intense solar storms, the regolith is expected to dissipate the build-up of charge too slowly to avoid the destructive effects of a sudden electric discharge, called dielectric breakdown. The research estimates the extent that this process can alter the regolith. “This process isn’t completely new to space science — electrostatic discharges can occur in any poorly conducting (dielectric) material exposed to intense space radiation and is actually the leading cause of spacecraft anomalies,” said Timothy Stubbs of NASA’s Goddard Space Flight Center in Greenbelt, Maryland, a co-author of the paper. The team’s analysis was based on this experience. From spacecraft studies and analysis of samples from NASA’s Apollo lunar missions, the researchers knew how often large solar storms occur. From previous lunar research, they estimated that the top millimeter of regolith would be buried by meteoroid impacts after about a million years, so it would be too deep to be subject to electric charging during solar storms. Then they estimated the energy that would be deposited over a million years by both meteoroid impacts and dielectric breakdown driven by solar storms and found that each process releases enough energy to alter the regolith by a similar amount. The next step is to search for evidence of dielectric breakdown in PSRs and determine if it could happen in other areas on the moon. Observations from NASA’s Lunar Reconnaissance Orbiter spacecraft indicate that the soil in PSRs is more porous or “fluffy” than other areas, which might be expected if breakdown was blasting apart some of the soil grains there. However, experiments, some already underway, are needed to confirm that breakdown is responsible for this. Also, the lunar night is long — about two weeks — so it can become cold enough for breakdown to occur in other areas on the moon, according to the team. There may even be “sparked” material in the Apollo samples, but the difficulty would be determining if this material was altered by breakdown or a meteoroid impact. The team is working with scientists at the Johns Hopkins University Applied Physics Laboratory on experiments to see how breakdown affects the regolith and to look for any tell-tale signatures that could distinguish it from the effects of meteoroid impacts. NASA funded the research through the Lunar Reconnaissance Orbiter (LRO) mission and the Solar System Exploration Research Virtual Institute (SSERVI) Dynamic Response of the Environments at Asteroids, the Moon, and Mars 2 (DREAM2) center at NASA Goddard. SSERVI is headquartered out of NASA’s Ames Research Center, Moffett Field, California. LRO is managed by NASA Goddard as a project under NASA’s Discovery Program. The Discovery Program is managed by NASA’s Marshall Spaceflight Center in Huntsville, Alabama, for the Science Mission Directorate at NASA Headquarters in Washington.